On days with extreme weather, children will wait inside and be called out when you arrive. YOU MUST HAVE YOUR CHILD'S NAME POSTED IN THE FRONT WINDOW DURING INDOOR PICK-UP. If your sign is not in the window you will need to park and come inside to pick up your child. PLEASE DO NOT USE YOUR CELL PHONE WHILE DRIVING. 7:30 - 8:30 A.M. AND 2:00 - 3:30 P.M.
#1. DO NOT TURN ONTO BROCE DRIVE FROM THE SERVICE ROAD (Interstate Drive). #2. APPROACH THE CCS PARKING LOTS FROM THE WEST ONLY. #3. NEVER BLOCK THE DRIVEWAY OF A NEIGHBORING BUSINESS. NEVER USE THE PARKING LOT OF A NEIGHBORING BUSINESS TO TURN AROUND. Our good standing with our neighbors depends on this. Please be considerate of our neighbors. #4. FORM A LINE IN THE EASTBOUND LANE OF BROCE DRIVE TO ENTER PARKING LOT. ELEMENTARY (2:50) PICK-UP LINE SHOULD NOT FORM UNTIL 2:40 TO AVOID INTERFERENCE WITH HIGH SCHOOL PICK-UP. #5. ENTER ELEMENTARY ENTRANCE IN TWO LANES. LEFT LANE TO DROP OFF IN NORTH PARKING LOT. RIGHT LANE TO DROP OFF ON WEST SIDE OF THE ELEMENTARY BUILDING. #6. DISPLAY THE ELEMENTARY "PICK-UP" SIGN IN THE WINDOW EVERY DAY FOR 2:50 PICK-UP. #7. ENTER THE HIGH SCHOOL ENTRANCE IN TWO LANES. THE RIGHT LANE IS TO DROP OFF STUDENTS AT THE HIGH SCHOOL DOORS. THE LEFT LANE IS FOR STUDENTS TO ENTER THE STUDENT PARKING LOT. Elementary students may be dropped off at any of the doors on the west (exit south) or north (exit north) side of the Elementary building. Secondary students may be dropped off at the east doors of the High School building. 2:30 - 8TH THROUGH 12TH GRADE and 6TH-7TH GRADE students with older siblings will be dismissed and parents will pick up students on the East side of the High School building and exit south. Older students will wait with their youngest sibling. 2:25 - 6TH AND 7TH GRADE students with NO siblings will be dismissed and picked up on the North side of the Elementary building and exit north. 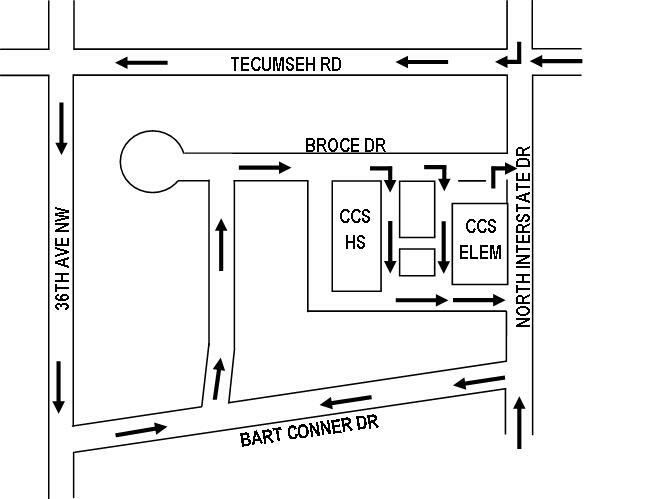 2:50 - PRESCHOOL AND KINDERGARTEN will be picked up along the West side of the Elementary building and exit south. Older students will wait with their youngest sibling. 2:50 - 1ST THROUGH 5TH GRADE will be picked up along the North side of the Elementary building and exit north. Older students will wait with their youngest sibling. Parents wishing to walk their child to class will need to park in the north parking lot or in the gravel lot south of the building and walk the child in through the main entrance. DO NOT LEAVE YOUR CAR UNATTENDED IN TRAFFIC LANES AT ANY TIME DURING THE DAY.